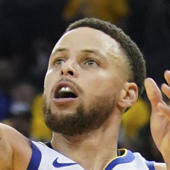 Curry registered 18 points (6-20 FG, 4-15 3Pt, 2-2 FT), eight assists, seven rebounds, three steals and one block across 35 minutes in the Warriors' 115-111 loss to the Suns on Sunday. Curry and fellow Splash Brother Klay Thompson were off their game Sunday, especially from distance. For Curry, his 26.7 percent success rate from three-point range marked his worst performance in that category since Feb. 2. The 30-year-old has drained just 12 of 36 attempts from the field overall in his last pair of contests, leading to his first consecutive sub-20-point tallies since early February. Curry did help boost his final line Sunday with his highest assist total since Jan. 21, as well as with his second multi-steal game of March. He'll look to bounce back in a showdown versus the Rockets on Wednesday night.